Garlic in Thailand packs a real punch. The cloves are small and are loaded with a true, refreshing garlic flavor. 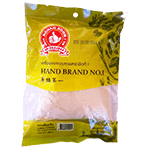 If you enjoy garlic, you'll love this Thai garlic powder which is so much better than the bland garlic powders you typically find in supermarkets. Thailand's best producer. All natural, no preservatives. Product of Thailand.